Hustler Zero Turn Mowers have an interesting history, dating back to a small town in Kansas in 1964. According to the company’s website, a local machinist named John Regier developed a new type of mower to help his wife cut the lawn ( sounds like a sweet deal Mr. Regier negotiated for himself, with his wife mowing the lawn. The least he could do was to invent a new mower to help out!). Basing the design of the mower on the steering system of haying equipment, the ZTR mower was born. These earlier mowers were driven by a mechanical transmission - hydraulic drive would be pioneered by Hustler in 1970. Excel began manufacturing Hustler soon after the design was invented, and they have continued a long tradition of innovation and quality. This is an excellent product. All the Hustler Zero Turn Mowers allow for side discharge and mulch. The deck cutting height is adjusted manually using a foot lever. The front axles on the entire Hustler Zero Turn Mower line is pivoting fabricated steel. This is standard on most homeowner ZTR mowers. The frames on all Hustler Zero Turn Mower models is fully welded tubular steel ( no bolts and nuts to come loose, compromising the frame strength). Hustler Zero Turn Mowers are available in 4 model series - the Sport; FasTrack; Fasrak Super Duty 48/54; and FasTrak Super Duty 48/54/60. The FasTrack models have more features, and come with a higher price tag. The Sport series is the lowest cost Hustler, and offers a choice between a single cylinder Briggs and Stratton 17.5 or 21 HP overhead valve ( OHV) engine, or the Honda GXV-530 twin cylinder OHV engine. The lap bars controlling speed and direction are padded. Integral parking brake is standard on all Hustler models. All the Hustler Sport mowers have an electric PTO to engage the cutting blades, which is activated by flipping a switch. The cutting deck is fabricated steel, which is the strongest way to build a cutting deck. Cutting width is either 42” ( 17.5 HP Briggs and Stratton engine) or 48” ( 21 HP Briggs or Honda engine). Model FasTrac 48/54 comes with either a 48” or 54” triple blade cutting deck. The FasTrac 48 has a variety of engine options, to include a single cylinder 19 HP Kohler; twin cylinder 18 HP Honda; or a 19 HP twin cylinder Kawasaki engine. The FasTrac 54 is powered by either the 20 HP twin cylinder Honda engine, or the 21 HP twin cylinder Kawasaki. In all the FasTrac models, the transmission has been upgraded to the twin Dual Hydro-Gear ZT-2800. The PTO engaging the blades is electric (of course). The deck construction is fabricated steel, and is simply superb. Beginning with the FasTrac models, some very interesting accessories are available which are not frequently seen in ZTR mowers. Want to show off your ZTR to the neighbors in the winter? Consider the optional snow blade and snow blower. A jack kit is available to lift this baby off the ground, and of course a stripe kit ( to make those great ball park lawn markings), mulch kit, and catcher are also available. 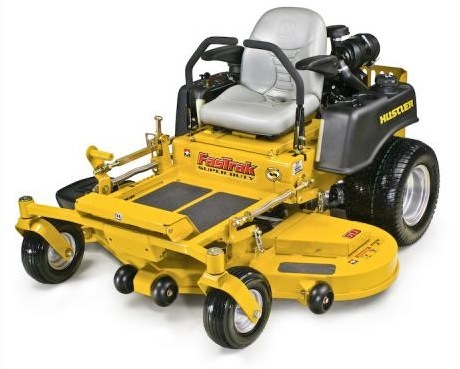 Since the options on this mower are so numerous, it would be best to call your local dealer for a price quote on the machine and features you are most interested in. Think of the Fastrac Super Duty 36/42 and the Fastrac 48/54/60 models as a FasTrac on steroids. These are really commercial grade units, pretending to be a homeowner machine. Everything about these mowers seems to say “give me your best shot”. Top of the line twin cylinder Kawasaki engines are the only option, with a choice between 17, 19, 23, or 25 HP. The transmission is the ZT-2800, complete with charge pumps and spin on filter. Cutting decks are heavy duty fabricated steel, and feature professional grade blade spindles that can be serviced. Need more? How about a fully adjustable high back seat supported by springs. The deck height is adjusted with a foot assisted lever. The parking brakes are automatically engaged when the lap bars are in the neutral position. A replaceable automotive type fuel filter keeps things running smooth. Quality like this does not come cheap. Hustler does not post prices on their website, but a loyal dealer network is there to answer questions and provide good service when needed. You won’t find these Hustlers at the local pool hall, but on the turf, they are hard to beat. Eat your heart out, Minnesota Fats. These mowers perform better on the green than you ever could.